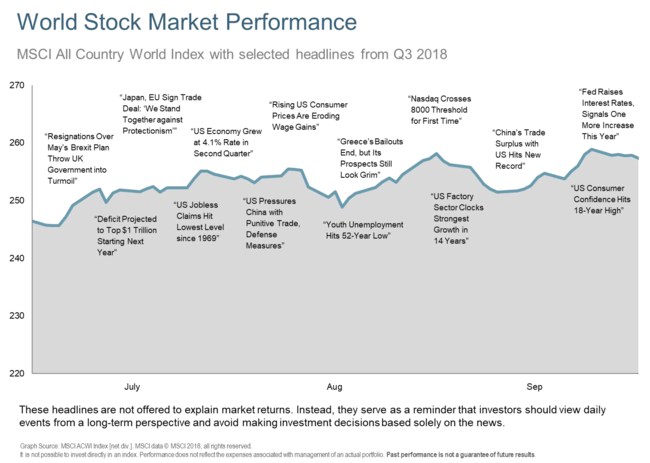 The S&P 500 hit a new record in Q318, increasing 9% for the year despite expected volatility due to ongoing trade disputes and rising interest rates. Robust corporate earnings, high business and consumer confidence and an unemployment rate at its lowest level in nearly two decades continue to be the catalysts. Contrary to past quarters, U.S. results were not a driving force in lifting other global equity markets. Europe continued to struggle due to trade concerns, ongoing Brexit negotiations, fear of widening budgets from populist policies in Italy and financial contagion resulting from the Turkish currency crisis. Japan, in contrast, closed the quarter up 8% on expectation that profits could remain steady into 2019, especially given their recent tax cut policies. Emerging markets, particularly Argentina and Turkey, continued to struggle with perceived affects from trade policy changes, a slowing Chinese economy, rising oil prices and a buoyant dollar. As expected, Fed officials raised the federal funds rate 0.25% in September to a range of 2.00% to 2.25%, and reaffirmed forecasts for additional increases late this year and throughout 2019. The bond market continued to respond with higher short-term rates while long-term rates remained steady with an occasional decline. As a result, the yield curve stood at its narrowest in more than a decade which can be indicative of a slowing economy. Several weeks into the new quarter, longer term yields are starting to increase in anticipation of the Fed’s objectives, tightening credit conditions and signs of modest increasing inflation pressure. The current yield curve is now beginning to reflect a growing economy, with a larger spread between short and long-term rates. 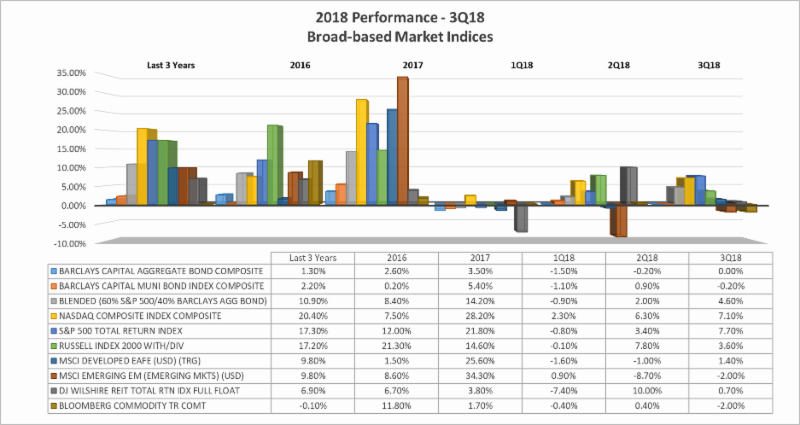 Bonds have decreased in price resulting in slightly negative total returns for the quarter and may continue to do so in anticipation of higher rates. Globally, the U.S. still is leading efforts to slowly tighten credit conditions with the expectation that Europe will follow by year end. Alternatives investments such as commodities, infrastructure spending, and steady sources of income were mixed for the quarter. At over $80.00/barrel, Brent Crude oil prices reached their highest levels since 2014. Declining supply and anticipated sanctions on Iranian oil output pushed prices higher. Agricultural and precious and industrial metals values moved lower in reaction to ongoing trade spats, mainly between the U.S. and China. Looking forward, there is an expectation for increased volatility as markets revalue. Inflation forecasts and interest rate increases will tempt equity investors to re-evaluate prices, as bond yields continue to generate more income than dividends for the first time in 10 years. Healthy debate continues with some experts pointing to continued corporate earnings growth, high consumer and business confidence, modest inflation and relatively low interest rates to support their views. Despite the lengthy expansion experienced over the last decade, they believe that there is more room to grow as the post crisis environment has discouraged the sorts of risk-taking and imbalances that bring on a recession. Other views point to signs of growing inflation coupled with a historically low unemployment rate as justification for the Fed to aggressively raise interest rates, thus choking off growth. Despite opposing views, most acknowledge that unfolding future events such as elections, a prolonged BREXIT agreement, an escalated trade war with China as well as unforeseen developments could change any projection. The adage, “There is no crystal ball” continues to be reliable. Diversified investment strategies within one’s risk tolerance and time horizon are still the best approach to managing your family’s wealth building goals. We welcome your questions or comments.